Outdoor Patio Furniture Maple Shade | What Type of Outdoor Patio Furniture is Right For You? Nothing beats relaxing in the comfort of your backyard following a busy day. Don’t get us wrong; vacations are wonderful, and we encourage them, but sometimes you need an immediate escape. You’ve finally cleaned up your yard and planted some gorgeous flower beds, so it only makes sense to spruce up your outdoor area with some patio furniture. You may not even know where to begin, but our experienced team at Spa Hearth & Home is happy to help you find the perfect backyard furniture. Will You Need To Store Your Furniture? If you store your outdoor furniture in a protected area during the winter, it will last much longer than if you leave it out in the snow. You could store your patio furniture in your basement or garage, provided that you have enough space. If you would prefer to store your furniture in the off-season, then consider buying furniture that easily folds away for your convenience. Remember that your patio furniture is subjected to all kinds of environmental elements, such as sun, wind, and rain. Therefore, it’s important to invest in quality furniture that will last you for many years to come. Plastic backyard furniture will only last you a year or two at the most, but furniture fabricated from heartier materials such as wrought iron will last you much longer. Because your furniture will be exposed to environmental elements, you want to purchase outdoor furniture that is easy to maintain. Consider purchasing furniture made from all-weather wicker, cedar, teak, or metal for easy maintenance. Do you want more colorful patio furniture or do you prefer more neutral pieces? Our outdoor furniture store includes both types of furniture in our inventory. One thing to consider is that neutral-colored pieces may hold up longer outdoors than more colorful pieced. You can always add some delightful pops of color to your patio using colorful throw pillows paired with neutral furniture. That super cool looking chair is totally useless if it’s painful to sit in. 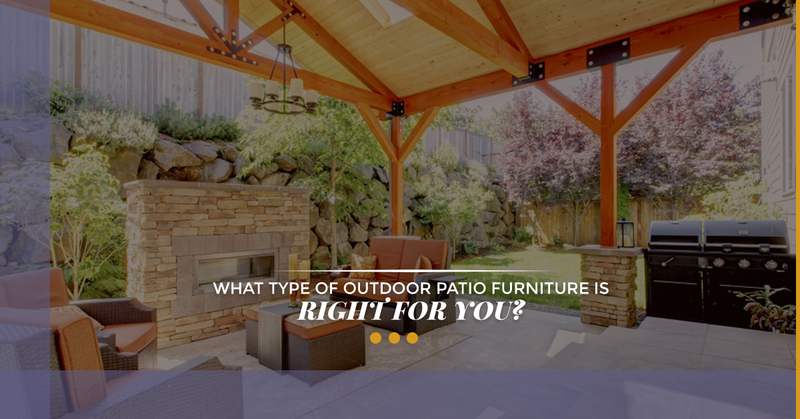 When shopping for backyard furniture, sit down in the various chairs and couches to see which ones are more comfortable. The more comfortable your patio furniture, the more you will be able to enjoy it. Nothing ties together your patio furniture quite like a nice outdoor rug. An outdoor rug truly adds to the overall relaxing atmosphere of your outdoor space. There’s nothing like walking barefoot on your patio rug on a hot summer day. To really amp up the ambiance of your outdoor space, add some sparkly lights to provide soft lighting. Sparkly little lights provide a truly welcoming and relaxing atmosphere while entertaining your loved ones. Perfect for a dinner party or having drinks in your backyard, everyone will compliment you on your lighting. We hope that these tips help you decide upon the perfect patio furniture. Stop by our showroom at Spa Hearth & Home today to browse our selection of outdoor patio furniture today.